A light and exceptionally delicious salmon dinner! The salmon is poached, and served on a bed of millets and veggies lightly sauteed in sesame oil. We love adding pineapple and cashews, but those items are optional! Prepare millet per package directions. Add sesame oil to a frying pan, and add the chopped veggies and pineapple. Saute on high, and cover to allow to steam for 3-5 minutes, leaving the veggies a bit crisp. Remove veggies from pan, and add about 1 1/2 cups of water - enough to cover the bottom of the pan with about 1 inch of water. Once the water is simmering, add the salmon, and lightly season with sea salt. Cover, and allow to poach on medium heat for 5-7 minutes, until salmon is cooked through. 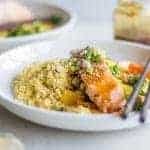 Layer bowls with millet, veggies, and a piece of poached salmon. Garnish with cashews, teriyaki sauce, sesame seeds and scallions. *Nutrition Facts do not include Teriyaki Sauce. The values for the sauce are located on that recipe post.